First I love Stardock and hope they keep making/supporting games. Here's a few things (or missing things) that really make it feel like an incomplete game. I just ask myself over and over "why can't I do this? I've done this in every other 4X game I've played and there's no way I'm the only one." Okay I know this is a little thing, but if i want to tweak something on a custom race I can only copy, make the changes and then delete the old one? Why is there no edit option! Why! 2)No Research Costs Displayed-only how many turns. Don't assume you know what I want done with the data and convert it for me, if I want it converted I'll do the math. Like your phone telling you how long ago the person called instead of when they called. I think this is a really big thing, so big I went over and over the options panel convinced I just had to change some setting. So there's no way to know how much research overspending you're doing every time you complete a project. Much more importantly when you spend those precious ideology points in benevolence that give you tons of research points you have no idea how many of them are going to disappear after the only project you had selected (see #3) that had 1 turn to complete is completed. First of all don't try and tell me you can just because if the last thing you selected when you exited research just so happened to be the next thing on the tech tree and you just so happened to want the optimization on the top (cause that's what you're gonna get!) because it's not the same as a research queue. There's no list on the top right, just the one project. So even if the game's creators want the game mechanic of overspending and not allow research points to carry into the next project (which is a stupid mechanic if you ask me, and they probably don't want it) it would still be nice to plan the order of the projects and not be forced to go to the research page after each completion. Not to mention the latter part of #2 would be fixed if you could simply queue research projects. Seriously why can't you queue research! Why! 4)Optimizations obtained via diplomacy lock you in. I'm pretty sure this one's an official bug (as opposed to options/features that any sane person should expect in a non-beta game), I've seen other posts complaining about it. So if you obtain an optimization via diplomacy after you've already chosen/researched one for yourself s'all good and you get the benefits of both. However if you obtain it (either by bargaining or as a gift from a race that likes you) before you've done it for yourself the game assumes that's what you did for yourself, and now you can't do another. You get the "optimization has already been chosen" or whatever it says tool-tip. I agree with 2-4. Especially 3! I've found that if I select the next tech in a line after the one I'm currently researching, I do in fact get research rollover; otherwise I don't seem to get rollover. Regarding #1, they addressed this in a twitch stream and explained that it is a stability issue and is working as intended. It's really only a couple extra clicks ("copy" and "delete"), that allows full editing without risking crash issues. 1) Alphabetical sort features for ships, planets and bases. If it's there, I ain't finding it. Trying to find a particular planet or ship can be trying sometimes. 2) Perhaps a sort ship by class option. 3) Some animation screens for planet invasions. I find the current planet invasion rather anti climatic. 4) Clicking on a planet in the gov screen and having the map center on the location. Again if it's there I ain't gettiing it. 5) Rally Points can set anywhere. I miss the rally points features of Gal Civ 2. Yep, really enjoying the game but Im not clear on a lot of the mechanics and I cant seem to find any documentation. For example, in a game where I had a large empire some of the planets I conquered always stuck at approval 0 no matter how many entertainment centres I built. The number never went up so they didnt rebel but I couldnt understand why. Likewise a number of planets controlled by other races had an approval of zero, had zero percent in rebellion but the figure never went up even though they were within my sphere of influence and I had sunk a lot into culture buffs. Another problem is the UP. Mousing over the different races I can see what percentage of the votes they have but when selecting an option to vote on I dont know what percentage I control. I can see a bar which I think reflects my relative strength but no exact figure is shown. It would also be nice to be able to see what option a race intends to choose. If we are voting on a president for example I think its reasonable there would be some horse trading between races or even an indication of what way a race is going to vote. This would allow me to vote accordingly. For example, if they didnt intend to vote for me maybe I would instead vote for their intended option rather than fragment the vote for a race with my ideology and lose out to an enemy race. I think the battle viewer adds nothing and I find myself not bothering with it. Its non-interactive (something like MOO2 would be great) and as a cinematic experience really doesnt work. It would be better to have some high quality scripted videos showing off the latest ships and tech. I liked the battles in endless space for example - nowehere near enough interactivity but pleasing to watch (or at least much more so than the battle viewer). Does any race have cloaking tech? Even if the cloak just worked on the map (as opposed to conferring advantages in combat) it would add a lot. We have it in the real world with US stealth fighters surely we should have it in a sci fi setting. For DLC I really want espionage! Especially given recent real world events espionage is sorely missed. Overall a great game though. 1) When I click on another race's planet I want to be able speak to them. It is too clunky to go through the diplomacy section especially when the only thing which gives away the race is the logo. You can easily forget it when playing with a ton of faction. Very bothersome to double check. 2) Being able to assign trade routes as I see fit on not having the freigther automatically start form the origin of the shipyard. 4) Customize the feature "get constructer" from starbases. I want to assign the design and especially the starbase. As of now it only takes the nearest. I usually have some high output starbases. I am happy to let the constructer move a bit further if it means I can build them a lot faster. 5) When you overtake planets I think you always have to manually upgrade the improvements. Why doesn't the auto upgrade function work here? 6) Being able to see when colonies have upgrades avaible. Like a small icon which indicates it. This should include new addable tiles too. A lot of people have specialized planets with no manufacturing at all. It's easy to forget about them. Maybe even have a way to access all upgradeable planets in an extra tab as it would still be very bothersome to look through a big list of colonies to find them. 8) The focus of objects is often not clear enough. When I click on an idle ship I often don't exactly know where I am. This is from the top of my head. There are more which I will add when I played another round. And I am not going to address the whole diplomacy again which I absolutely dislike but would require a bigger overhaul. My points mentioned so far should be more or less doable. Totally an overt declension. They were protecting us form our self .. rightly or wrongly. And how big a deal is it anyway >> copy, make changes, save, delete old (if you want). Half would complain if it were the other way . I would prefer to see both , but if i only get one i prefer turns (MO). Planet Screen: I would like to have an indication where in my empire the planet is (center or frontier). +1 Better and more sorting and filter options. +1 Select constructor type and location for request tool. All those are great suggestions. I'm not sure how to quantify this, but it is difficult to visually scan a zoomed out map and find what you are looking for as compared to GalCiv2. and many are really needed to improve gameplay. and necessary turns for next point. Show planets without/witch specific ideology generation. weak compare to this points. together. Like the 6 most wealthy planets are in Group Goldfarmer. for this specific group. Not the whole empire. go through my other 100 planets! Manufacture = 30, Wealth = 0 and Research = the rest. the 200 th time is not adding anything to the gameplay. I only need 4 Classes of ships [colony, constructor, assault, survey]. If you played Europa Universalis you know what I mean. Just taking over any player before loading a save game. his perspective. Maybe a galactic Alliance could crush me. I have 30 savegames. And often switch between them. easier into previous saved games. full technology unlocked. And let them duke it out. so on. Which would win? Yeah I said right away this one isn't a big deal. Totally agree with this one, I used the simulator tool tons in Space Empires IV. Just FYI, I believe research points do carry over to the next project, but yes a que is really needed. Blame multiplayer. They had to design the system a certain way to make it possible to share custom races. They hope to have a work around soon. It was brought up in one of the many dev streams. Set as an option. Personally I like the whole guessing game. To me its more realisitic. Especially when the research carry over from the previous research pops it out sooner. There is a "Queue" system in place. It is lame and needs to be made better so I do agree with the request but there is one. I would so love to tell an alien to shove off when it tries to give me such a "gift". I hate having to shut off tech trade to avoid this issue if I really want to speciallize something just right for research purposes. I don't know that I'd blame multiplayer for this. Fallen Enchantress and Legendary Heroes lacked an option to edit custom sovereigns and custom factions, too. That was the explanation on one of the dev streams. Even though there is no research queue, there is no wasted research points. Research points do carry over to the next tech you select, regardless of which tree the tech is located. Sorts! Lots and lots of sorts for all lists that can grow to over 10 items, such as planet lists, ship lists, ship lists in shipyards, ship lists in ship designer, Star base lists, Rally points, etc. Sorts by: for planets: name, population, class, quality, habitation condition, approval rate, income, top item on production queue, more. for ship lists in shipyards: ship name, ship class, ship hull size, defense, weapons, more. for ship lists in designer: ship name, ship class, user/core, hull size, defense, weapons, more. for rally points: name, distance from selected ship, planet, or shipyard. more. Please note that this is urgently needed. The game is heavy and cumbersome without these sorts and filters. Sorts and filters are very much needed. Paul said during once of the launch-week devstreams that they'd like to have a UI element to show you the location of stuff (ships, planets, etc) but that designing that feature has been tricky. As a workaround, I believe if you exit the planet screen the map will be centered on that planet. Everything you need to know about a planet is buried in a mouse-over tooltip, (including the lore). I cannot describe how much I HATE that. The issue is that they're basically designing for any screen, which means they're designing for the smallest screen. So in order to free up space and not clutter everything with numbers, they decided to hide vital information in tooltips. Which leaves them with nice, spare screens that have a LOT of dead space. Is this the planet with the research bonus? or the happiness debuff? or the manufacturing bonus? or... wait... is that 15% bonus because of the colonization event? or is it from something else? Since I'm looking at this, can anyone explain to me the huge empty boxes under Manufacturing, Research, and Net Income and why they're not populated with the tooltip information? Instead there's these little icons (which are made pointless by the fact that the actual number is present). Why are we using precious screen real-estate to show how much we adore (and rip off from) the Civilization franchise. agreed to sorting functions - that is really a must. concerning planetary sliders - i admit it can be cumbersome but on the other hand, you get the opportunity to micromanagement your production better. also miss rally point functions of GCII - auto attack, etc. QUOTE: Everything you need to know about a planet is buried in a mouse-over tooltip, (including the lore). I cannot describe how much I HATE that. The issue is that they're basically designing for any screen, which means they're designing for the smallest screen. So in order to free up space and not clutter everything with numbers, they decided to hide vital information in tooltips. Which leaves them with nice, spare screens that have a LOT of dead space. Here i do not agree: lot of dead space, maybe, but it is a clean view. if you need details -> hover over it. if you want to have a "strategic" info -> rename your planet. i used to rename research-heavy planets R-Moon, economy worlds E-Vega 12 but that was GCII. i think now you even have a mouseover in diplomatic screen to tell you, that you are about to trade your 18+ world full of research buildings against a barely habitable one? Not sure if it's mentioned already but there's no way to sort planets either. Not by size or population or anything, unless I'm missing a screen that sorts them somewhere. Top of the main screen, click the button that says Govern, then go to the Colonies tab. There's a list there that can be sorted by name, planet class, population, influence, approval, research output, net income, and manufacturing output. Only works for your colonies, though. Yeap I saw that one. 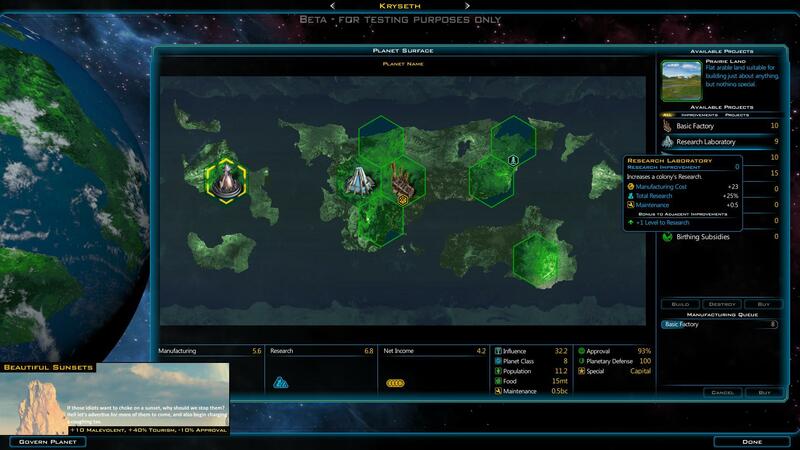 I was thinking from the main screen, where your colonies are listed on the right hand side. There should be little icons right there for alphabetical, pop, etc etc. GC2 had them but on a info screen on the left hand side I think. It was great for sorting without having to go to the in depth screen you're talking about. It is my opinion that this game is lacking a lot of polish and right now has very poor cpu utilization.